The purpose of this article is to serve as a general strategy guide with tips and advice that you should follow when attempting to win a barbecue food challenge. There are many different varieties of BBQ eating challenges all around the world, and they come in all shapes and sizes. Some challenges involve just one massive piece of meat, such as beef brisket, and others involve smaller amounts of multiple different kinds of meats. The typical meats used in barbecue food challenges are beef, pork, and chicken, but there are many different kinds of those meats served. Your challenge may include beef ribs, beef brisket, or pulled BBQ beef. It may include pork ribs, sliced pork, pulled pork, or even pork sausage. You may also encounter pulled chicken meat, whole chicken breasts and thighs, or you may just get an entire half of a chicken. There are even some with a few wings added in as well. 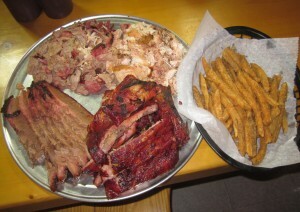 Each barbecue restaurant prepares and seasons their meats differently too. One BBQ challenge may involve smoked meats using hickory wood chips and charcoal, and then another challenge may involve meats grilled directly over an open wood fire and flame. Alongside those delicious meats, most barbecue challenges involve multiple side items such as coleslaw, baked beans, french fries, onion rings, and macaroni & cheese. You may even get some Texas toast or corn bread too!! Even though there are many different variations that you may encounter, the basic strategy that you need to have remains similar for every variation. Before we go into the specific strategy details for winning a barbecue food challenge, please make sure you have read and understand our Basic Strategy For Winning A Food Challenge article. It’s full of 14 different basic strategy tips that won’t be included in this article, which you need to understand before attempting a barbecue challenge. Please start off by watching our very informative How To Win A BBQ Challenge video so that you can visually see all of our different tips put into practice during an actual BBQ eating challenge. For this video, I attempted The 4 lb Pork Steak Challenge at The Beerhouse Restaurant inside River City Casino in St Louis, Missouri. During this challenge, I had to finish 4 pounds of delicious BBQ pork steak along with 1 pound of onion rings and 1 pound of potato salad in less than 45 minutes. Winners get the meal free and a shirt along with multiple other prizes. 1. Make sure that your meats are cooked correctly – For the most part, this won’t apply to most barbecue food challenges, because most of them involve pork, chicken, and beef meats other than steaks and burgers. There are federal laws and health codes that restaurants must follow when cooking and serving pork and chicken meats. They are not like beef steaks and burgers, meaning that you cant get them medium rare or any certain temperature like that. You won’t get any kind of choice for how you want your ribs, beef brisket, or anything like those either since most barbecue meats have already been smoked and cooked well before you get there, and are just waiting to be served. Most of the time, this won’t really make any difference, but you may just want to clarify with the cook or manager that the meats are tender and juicy, rather than dry. You definitely don’t want to bite into a dry rack of ribs or any other meats because they will take forever to chew and swallow, along with plenty of extra liquids. If you do get a choice, follow our How To Get Your Steak Or Burger Meat Cooked article. 2. Take small bites so you can eat more efficiently – Especially with tough to chew meats, be sure to take plenty of small bites rather than just a few large ones. You will be able to swallow much faster and be more productive while you are eating. If you are taking on a huge piece of meat like a five pound lump of brisket, use a very sharp knife and cut very small pieces, just like we teach in our How To Win A Steak Challenge article. If your meat is already cut up, whether you use your hands or utensils, take many small bites so that your jaw doesn’t have to chew and work as much. You don’t want it to get tired early on in the challenge!! You will also be able to use your tongue to move the food around more easily and place it all in a position so that it can be swallowed faster. The same goes for if you are eating ribs. Take many small bites, and don’t try to pull the entire chunk of rib meat into your mouth at one time. Take many small bites and both you & your jaw will be very happy with the results. 3. If there are multiple meats, eat the toughest ones first – If your challenge consists of just one large piece of meat, like the 4 pound pork steak challenge we used for the video, this doesn’t really apply. If your challenge is similar to the picture we used for the article though, this definitely applies. If your challenge involves multiple meats such as pork ribs, beef brisket, pulled pork, and chicken, then you need to start out eating the toughest meats first. If your challenge involves ribs, you may want to eat those first while they are hot, juicy, and tender. Once they cool down and dry up, they won’t be nearly as delicious and fun to eat. If your challenge includes chicken wings or any other bone-in meats, eat those in the beginning too. Brisket is also a tougher meat. Save the pulled meats for last because they will be easier to eat, and even easier if there is already barbecue sauce on them. Before beginning, while you are building your strategy and plan of attack, decide which meats will be the toughest. You may just need to feel them all when your meal gets placed in front of you. Eat the toughest parts first while you are fresh, and then the challenge food will continue to get easier to eat as you continue. 4. Use sauces to mix up the flavor and drinks to help consume dry meats – Some barbecue challenges are served with the sauce already on the meat, and some are served sauceless so that you can choose which sauce you want and add it yourself later. If you have a choice, what you pick is really just up to your personal preference. I enjoyed the sauce already on my pork steak in the video. I recommend avoiding sauce if possible on sandwiches and burgers so that it doesn’t soak into the buns, make everything messy, and make the entire meal taste like the sauce. Getting sauce on barbecue meats is completely different though since the sauce only touches the one meat it’s served on. Feel free to get the sauce you want already on there to make the meat much easier to swallow, or you can always play it safe and just dip your meat in sauce later to switch up the flavor. If you end up biting into a dry piece of meat, whether it’s late in the challenge or early on, just use a few sips of liquid to help swallow the food faster. Using liquids will be much more effective than using sauces. Stick to using sauces for flavoring, and drinks for helping you swallow the food faster. If the meal is prepared properly, you shouldn’t need much of either, but of course that doesn’t always happen. Even finer restaurants make errors sometimes. 5. If you are able to choose your side items, select the smartest options – In the challenge I did for the video, I was not able to pick my side items, and had to eat onion rings and potato salad. More often than not, your side items are already selected for you. In that case, you just have to adjust and conquer. If you get to choose them though, be smart and base your selection off our very helpful Best Sides To Order For A Food Challenge article. 6. The order you eat your side items is mostly up to your preferences – If you only have one side item, such as the french fries shown in the challenge photo we used for this article, this doesn’t apply to you. If you have to eat multiple side items, such as coleslaw, macaroni & cheese, and two pieces of corn bread, then you need to decide what order you want to eat those in. It would be inaccurate to specify a particular order to eat your side items here because the decision mostly depends on your personal taste buds and preferences. It would be smart to eat your least favorite item first while you are the most fresh. If you dislike the taste or texture of coleslaw, then eat that first before the foods you do like. If you like all the items equally, you may want to eat the items most affected by temperature first. If your challenge involves macaroni & cheese or something similar, then eat that first because it just continues to thicken and become tougher to consume as time goes on. Macaroni salad, served typically just like coleslaw and potato salad, is completely different because it’s not really affected by temperature, so eat that when you want to. You may even want to eat your creamy sides along with your last few bites of meat to make them easier to swallow. Like I say in the video, I like eating fries, onion rings, and similar foods at the very end along with some carbonated soda. I eat coleslaw and all other similar items first before the fries and onion rings. If your challenge includes bread such as Texas toast or corn bread, where in the order you eat that is also up to you. Some people may prefer to eat it early on, and some people may want to eat it last even after the fries. Be sure to plan the order you will eat your side items in. Get those down and get the win!! If you combine the tips above with the Basic Strategy Tips For Winning A Food Challenge, you have all the major advice and knowledge you need to plan the strategy you will use to dominate your next BBQ eating challenge.